In the early 1950s, the United States Military began a design program to develop tanks that would replace those currently in service. The faithful M4 Sherman had begun to show its age and was in the process of being replaced by the M26 Pershing and the upgraded M46 Patton. At their core, however, these tanks were still very much vehicles of World War II era and did not make use of newer technologies that had begun to appear. One of the tanks to spring from the design program was the Medium Tank T42. Other tanks to spring from this program included the Light Tank T41 and Heavy Tank T43. These would become the 76mm Gun Tank M41 Walker Bulldog and the 120mm Gun Tank M103 respectively. At a meeting at Detroit Arsenal on the 28th of September 1948, specifications outlined by the United States military for a new Medium Tank were put forward. On the 2nd of December, the designation of Medium Tank T42 was secured. Coaxial .50 Cal (12.7mm) and .30 Cal machine guns. A number of these initial features were based on the Prototype Light Tank T37. This included the blister mounted machine guns. Other features included a similar chassis length with five road wheels, powerplant and transmission, mudguards/sand shields over the tracks, and a turret ring diameter of 69 inches. This was the same diameter that was introduced in 1941 with the M4. Construction of a mock-up was approved in March 1949 and reviews of this model were held in October and December, with a number of suggestions put forward to improve the design. The similarities to the T37 began to disappear. Ground contact length was increased from 122 to 127 inches (3.09 to 3.22 meters), the turret ring was widened to 73 inches and finally, the turret mounted blister machines guns were deleted. The hull of the T42 was a combination of two parts. The forward bow portion was a single homogeneous steel casting, while the rear was a welded assembly of steel armor plates. The two halves were welded together in the middle of the tank. The casting of the upper glacis plate was 4.0 inches (101.6 mm) thick, sloped at 60 degrees. The T42 eliminated the archaic feature of a bow machine gun and accompanying crew member. As such, the driver was alone in the hull. Room left over by the absent crew member was taken up by a 36-round ammunition rack. The T42 did retain the engine and transmission of the T37. This consisted of the Continental AOS-895 gasoline engine (AOS: Air-cooled, Opposed, Supercharged) rated at 500 horsepower, and the General Motors CD-500 cross-drive transmission. This gave the tank a top speed of 41 mph (66 km/h). The driver operated the vehicle with the Manual Control joystick, often known as the ‘Wobble Stick’. The tank was considered underpowered, however. Tests were mounted by placing the powerplant in the hull of an unused Medium Tank T40 chassis and running it against a late model M4A3. These tests took place at the Aberdeen Proving Ground on the 7th of November 1950. The T42 proved to be only marginally more mobile than the M4, reinforcing the opinion that the tank was underpowered. The tank ran on a five road-wheels with the drive sprocket at the rear. There were three return rollers unevenly placed along the return of the track. The wheels were attached to torsion bar suspension. The turret was a completely new design, but not too dissimilar to that of the T41 (M41 Walker Bulldog) in length and shape. It was completely cast in construction. The lengthy turret bustle was used to store the radio set and also housing for the ventilator fan. The turret was manned by 3 crew members; Commander, Gunner, and Loader. The outside of the turret was dominated most noticeably by the armored housings of the stereoscopic rangefinder lenses. Also known as ‘Frog’s Eyes’, this type of gun system continued to see use after the T42 on vehicles such as the M48 Patton III and M103. Atop the turret, on the right, was the commander’s vision cupola with an AA mount for a .50 cal. machine gun. The loader’s hatch was to the right of this. It was suggested by a British liaison officer that the Ordnance QF 20-Pounder was far superior to the 90mm Tank Gun M3A1 used on the M46 Patton. Despite its use on Britain’s own Centurion and, being a more powerful weapon, the 20-Pounder was deemed unsuitable for use on a Medium Tank by the US. The US instead opted for a newly developed 90mm gun, the T119. This gun was a vast improvement over the M3A1. Firing it’s APDS (Armor-Piercing Discarding-Sabot) round, it could punch through 11.1 inches (282mm) of homogenous steel armor, angled at 30 degrees, at a distance of 1000 yards (914.4 meters). The main armament was complimented by the coaxially mounted Browning M1919A4 .30 cal. (7.62mm) Machine Gun and Browning M2HB .50 cal. (12.7mm) Heavy Machine Gun. On the 7th of November 1950, the United States Ordnance Committee instigated a change in nomenclature for tanks in the US Military. It was decided that weight designations (Light, Medium, Heavy) were no longer suitable due to changes in the way tanks were developed and employed on the battlefield, and the varying calibers now available. The caliber of the gun replaced the weight designation. For example, the T42 changed its designation from ‘Medium Tank T42′ to ’90mm Gun Tank T42’. Six prototypes were constructed and finally delivered to the Aberdeen Proving Grounds for testing on 30th December 1950. However, by this time, the Korean War had been raging for a full six months. To put it mildly, this caused a bit of a panic among the hierarchy of the US Military, and a crash program was launched to find a suitable tank to field in the conflict. The death warrant for the T42 was signed when the US Army Field Forces (AFF) declared the tank unfit for production. This did not stop the Ordnance Department though, who continued to work on the tank in the hopes that it could yet become the US Army’s next Medium Tank. Prior to this, in November, work had begun on the T42’s replacement, designated as the 90mm Gun Tank M47. Characteristics of the vehicle were outlined in January 1951. The immediate answer to the panic was found by returning to the current tank in service, the M46 Patton. It was found that most of the T42’s issues were with its hull and the turret was found to be perfectly serviceable. As such, a program began to mount the T42 turret on the hull of the M46. The M46 was slightly modified to accept the new turret. This modification took the form of expanding the hulls turret ring to match the turrets at 73 inches. This combination was tested with the use of an M46 hull. This vehicle was designated the M46E1. Only one was produced for tests purposes. To bring the M46 hull up to the requirements for the M47, the angle of the 4-inch (101.6mm) upper plate was increased to 60 Degrees from the vertical. The air filter in the upper hull front was also removed, giving a better contour to the armor profile. This configuration was accepted and serialized as the Medium Tank M47 Patton II. However, it arrived too late to serve in the Korean War. The tank was declared obsolete in 1957 in the US Military but went on to see service in the arsenal of other countries military’s. In the US, the M47 was replaced in service by the 90mm Gun Tank M48 Patton III. The 90mm Gun Tank T42. The 90mm Gun Tank M47 Patton II, the combination of the T42’s turret and the hull of the M46 Patton. The Medium Tank T69 with an Oscillating Turret mounted on the Hull of T42 Prototype vehicle no. 3. The Aberdeen trials began with automotive tests. In an effort to improve the T42’s mobility problems, the prototype vehicles sent to Aberdeen were fitted with the upgraded AOS-895-3 engine and CD-500-3 transmission. Thanks to the substitution of some steel parts with aluminum, this incarnation was 500 pounds (227 kg) lighter than its predecessor. The overall performance was improved, finally meeting the original specifications and surpassing the results of the previous test using the T40 hull. The Army Field Forces were still not impressed enough. Considering the T42 still much too underpowered, they continued to refuse its adoption. By this time, their attention had shifted to the M47 and T48 (later M48) development program. The trials did not start well for the T42. Pilot vehicle number 1 was completely destroyed by a catastrophic fire caused by a loose pin in the final drive which tore a hole in the fuel tank. This resulted in fuel spraying over hot components of the engine. The tank was a fireball in seconds. Pilot vehicle number 2 arrived at Aberdeen in April 1951 to continue the now delayed automotive tests. This vehicle was later modified to allow the installation of a new transmission, the XT-500. This necessitated a modification the rear hull. This took the form of replacing the sloping rear hull plate with a vertical one. The XT was more efficient and had a lower production cost of the CD model, with just 60 percent of the overall part-count. Despite the deletion of the blister machine guns on the turret, developers were keen to employ extra machine guns somewhere on the vehicle to compensate for the lack of a bow mounted weapon. One solution was the mounting of machine guns on the mudguards just above the idler wheels. This took the form of an armored box. The box would contain one Browning M1919A4 machine gun, 680 rounds of .30 caliber (7.62mm) ammunition, a pneumatic charger, firing solenoid and a compressed air bottle. The system would be operated by controls in the driver’s position. The guns were fixed in traverse and elevation. Though not practical to aim, it was found that the weapons provided a good suppressing fire over an area. Further development was suggested, mostly to add a degree of traverse in the guns, but it went no further. The whole concept was later completely dropped. 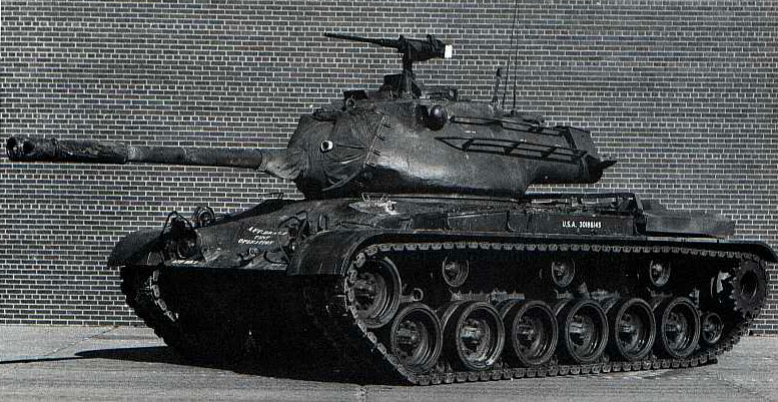 During the spring of 1953, in an effort to keep the T42 project alive, a plan was formed to turn it into an option for a lighter more economical tank. 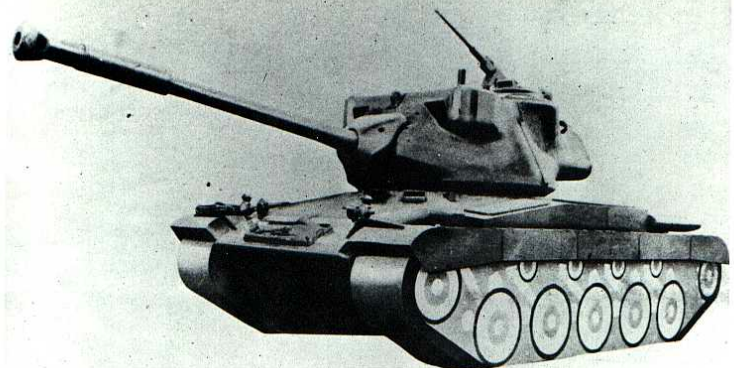 Modifications planned were a steel elliptical hull and flat track suspension (track return supported by road wheels, as used on tanks such as the Soviet T-54). Had these plans materialized, the vehicle would have received the designation of 90mm Gun Tank T87, or Medium Tank T87. May 1953 marked the end of this project and the whole T42 program in general. The project was officially ended in Autumn 1954. One of the original specifications for the T42 was not researched until almost a year after the tank was declared unfit for service. This specification was that an autoloader would be added when such a device was available. It was found that trying to add an autoloader in a conventional turret was impractical as the breach of the gun would have to return to a 0-degree elevation angle for it to line up after every shot. For this reason, it was decided that an oscillating turret would be the best option. Oscillating turrets are divided into two parts. A lower collar attached to the turret ring, and an upper portion with the gun fixed in place. The upper portion pivots on trunnions under hydraulic power providing the gun elevation and depression. With the gun fixed in place, the autoloader has a straight path to ram in the shells. The new turret was mounted on the hull of T42 prototype number 3 which was modified with the XT-500 transmission. The tank received the designation of 90mm Gun Tank T69, also known as Medium Tank T69. The tank took part in a number of trials but, like the T42, it was not accepted for service. It was found that the vehicle bore no advantage over conventional designs. No whole T42 survives today. The only way the vehicle does survive is through the uses of its parts. A single hull survives as the T69, which currently resides in storage at National Armor and Cavalry Museum, Georgia, USA. The turret can, of course, be found all over the world where there is an M47 on display. Wow, looks like the m41 walker bulldog/ t69 from wot. Was this a prototype for the m47 Patton? Indirectly it was. 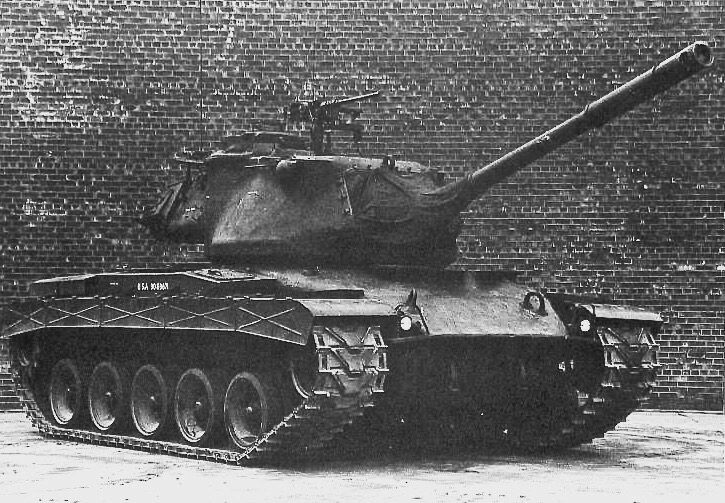 Basically the T42 had been intended to replace the M46 (which was an interim upgrade of the M26), however the T42 program failed which left the US without a modern tank to replace the M46. The solution was to upgrade the M46 hull further and replace the turret with the new turret and gun from the T42 to make the M47, another interim design (like the M46), until they could come up with a design that was satisfactory (the M48).